For a truly romantic island escape, our luxury Mozambique safari holidays are hard to beat. Combine Big Five game viewing in the Kruger Park in South Africa with pristine Benguerra Island. Fly in a light aircraft to Vilanculos & on to Benguerra island by helicopter. Our luxury safari & beach vacations offer exclusivity & a taste of paradise. All transfers, game drives & local flights included. Arrive at Vilanculos Airport in Mozambique. 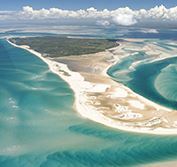 After completing customs formalities, you will be met by a lodge representative and transferred by helicopter to Benguerra Island in the spectacular Bazaruto Archipelago. Transfer by helicopter to Vilanculos Airport for your onward flight home.